I made a batch yesterday and I'm eating a piece as I write this. It's a pretty basic recipe, but foolproof and delicious. Remember it the next time you let a couple of bananas get too ripe. Cream together shortening and sugar. Add eggs and mix well. Mash in bananas. Combine flour, baking soda and salt (cut back or eliminate salt if using salted butter instead of shortening) and mix into wet ingredients. Stir in walnuts. Bake in a well-greased loaf pan at 350 degrees Fahrenheit for 60-70 minutes or until top is very brown and any cracks in the top are fairly dry inside. The original recipe had you prepare the loaf pan by greasing it, lining it with waxed paper and greasing the waxed paper. 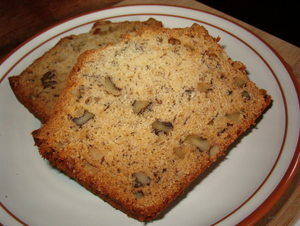 Then when the loaf was done, you removed it from the pan and peeled off the paper. At some point I just stopped doing that and began to grease the pan directly and the results have been fine. I don't really know why that seemed like a necessary step back in the day, but I merely mention it as a curiosity. On the cat front, we brought Velvet home yesterday and she's been as mellow and friendly as can be. Velcro seems to be equally mellow and accepting her just fine. Xena has turned into a hostile, hissing ball of stress, to the point that she wore herself out from her own drama and slept all evening when she'd ordinarily have been playing. Photos of Velvet to come tomorrow. Enjoy your Monday! I can practically taste that through the Internet. 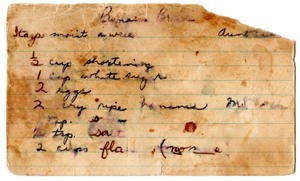 And I LOVE the old recipe card. Fun! That's great that you got another cat! Fingers crossed the plan works. I saw one of those home re-do/decorating shows in which they had framed "grandma's recipe cards" along with a photo of grandma. It made a wonderful display--there were ones made from several relatives.